Researchers at North Carolina State University have developed a device that allows people who are blind to monitor their guide dogs, in order to keep tabs on the health and well-being of their canine companions. The work was led by Sean Mealin, a PhD student at NC State, who is blind. This photo shows Mealin and his guide dog, Simba, using a traditional guide dog harness and handle. "Dogs primarily communicate through their movements and posture, which makes it difficult or impossible for people who are blind to fully understand their dogs' needs on a moment-to-moment basis," says David Roberts, an assistant professor of computer science at NC State and co-author of a paper describing the new technology. "This challenge is particularly pronounced in guide dogs, who are bred and trained to be outwardly calm and avoid drawing attention to themselves in public." To address this need, the researchers have developed a suite of technologies that monitor a dog's breathing and heart rate and share the information with the dog's handler. "Our goal is to let guide dog handlers know when their dogs are stressed or anxious," says Sean Mealin, a Ph.D. student at NC State and lead author of the paper. "This is important because it is widely believed that stress is a significant contributing factor to early retirement of guide dogs and other service animals. The technology may also be able to help handlers detect other health problems, such as symptoms of heat exhaustion." The issue is particularly important to Mealin, who is blind and works with his own guide dog, Simba. The research team had previously developed monitoring technologies that are incorporated into a lightweight harness that can be worn by rescue or service dogs. The trick was to find a way to share that monitoring data with users who are blind - and to do so in a way that allows those users to act on the information. "We didn't want to give handlers an endless stream of information that would be difficult to interpret," Mealin says. So, the researchers developed a specialized handle that attaches to a guide dog's harness. The handle is equipped with two vibrating motors. One motor is embedded in the handle by the handler's thumb, and vibrates - or beats - in time with the dog's heart rate. When the dog's heart rate increases, so does the rate at which the motor beats. The second motor is embedded in the handle near the handler's pinky finger, and vibrates in synch with the dog's breathing. The vibration increases and decreases in intensity, to simulate the dog breathing in and out. "We wanted to use electronic signals that intuitively make sense for the dog handlers," Roberts says. The prototype handle has been tested using simulated heart rate and respiratory data, and was found to be effective at accurately conveying information to users. "We're refreshing the design and plan to do additional testing with guide-dog handlers," Roberts says. "Our ultimate goal is to provide technology that can help both guide dogs and their people. That won't be in the immediate future, but we're optimistic that we'll get there." Developed in the US, the harness is fitted with sensors that monitor both a dog's posture and its vital signs and can pass the information to an owner. It also contains vibrating motors so owners can communicate with a dog even if it is out of sight. The harness could help with training or refine how working dogs and their handlers cooperate. 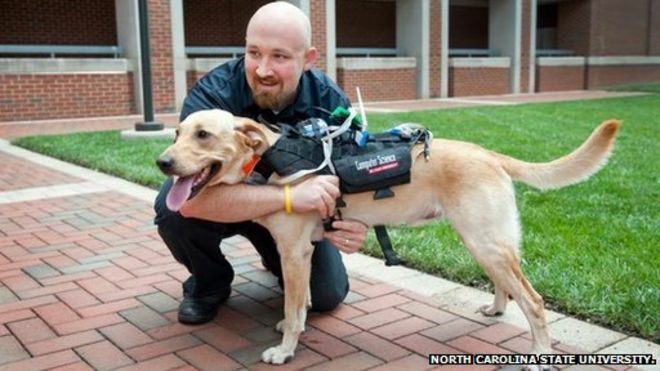 The harness was fitted with motion detectors to help interpret a dog's body language - their primary means of communication, said Dr David Roberts, an assistant professor of computer science at the North Carolina State University, who helped develop the prototype. "We can determine when they're sitting, standing, running, even when they're out of sight," he said in a statement. More subtle information about a dog's wellbeing is also gathered via heart-rate and body-temperature sensors. These can alert people if a dog is stressed or excited. "We're reliant on the physiological and behavioural sensors to give us a picture of the dog's mental and emotional state," said Sean Mealin, a PhD student at NC State, who has also worked on the project. "This can help handlers identify and mitigate stress for the dogs," said Mr Mealin. "It's an important issue. Particularly because guide dogs are bred and trained not to display signs of stress in their behaviour." In addition, handlers can add another layer to the way they communicate with a dog, by making motors on the harness nudge a dog to reinforce a spoken command or prompt a dog to take action if it is a long way away. Finally, the wearable tech can be augmented with a variety of other devices, such as microphones, cameras and environmental sensors that can gather data, as from dogs being used in disaster zones. The creators of the harness are now working on a miniaturised version and improving its sensors so they can be used in animal shelters and hospitals to monitor the wellbeing of animals in care or recovering from treatment. As parents, all of us have fought the battle with our kids as they are absorbed into a video game or movie on an iPad, tablet or smartphone. We've had a better chance of getting the attention of Tom Cruise walking the red carpet than our kids.